Leigh Corfman says she was 14 years old when an older man approached her outside a courtroom in Etowah County, Ala. She was sitting on a wooden bench with her mother, they both recall, when the man introduced himself as Roy Moore. It was early 1979 and Moore — now the Republican nominee in Alabama for a U.S. Senate seat — was a 32-year-old assistant district attorney...Alone with Corfman, Moore chatted with her and asked for her phone number, she says. Days later, she says, he picked her up around the corner from her house in Gadsden, drove her about 30 minutes to his home in the woods, told her how pretty she was and kissed her. On a second visit, she says, he took off her shirt and pants and removed his clothes. He touched her over her bra and underpants, she says, and guided her hand to touch him over his underwear...Two of Corfman’s childhood friends say she told them at the time that she was seeing an older man, and one says Corfman identified the man as Moore. Wells says her daughter told her about the encounter more than a decade later, as Moore was becoming more prominent as a local judge. Aside from Corfman, three other women interviewed by The Washington Post in recent weeks say Moore pursued them when they were between the ages of 16 and 18 and he was in his early 30s, episodes they say they found flattering at the time, but troubling as they got older. None of the three women say that Moore forced them into any sort of relationship or sexual contact...Neither Corfman nor any of the other women sought out The Post. While reporting a story in Alabama about supporters of Moore’s Senate campaign, a Post reporter heard that Moore allegedly had sought relationships with teenage girls. Over the ensuing three weeks, two Post reporters contacted and interviewed the four women. All were initially reluctant to speak publicly but chose to do so after multiple interviews, saying they thought it was important for people to know about their interactions with Moore. The women say they don’t know one another. Prudent to withhold further judgment until we have a more complete picture of verifiable facts. 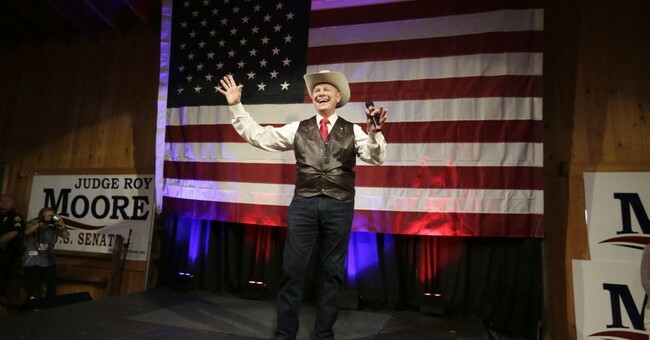 But on its face, Moore -- who favors outlawing sexual contact between gay *consenting adults* -- stands accused of molesting a high school freshman when he was a grown man. ?? ...so I guess I find these accusations pretty credible and really disturbing, even as I harbor some doubts about timing. I'm also trying to look at the situation as fairly as possible, in spite of my profound distaste for Moore as a public figure. Alabama elex spox John Bennett just told me that if the GOP withdraws their nomination of Moore, and notifies their office, he will remain on ballot but even if he gets most votes, won't be certified as winner b/c party has withdrawn nomination.